When I was a little girl, people handled trash differently than they do now. Food scraps, too small to save got divided into dog food and pig food. Paper got burned in the trash barrel out back. We saved cans, glass, and plastic that we could “re-propose.” Only about one small ash-can of junk went out to the road for pick-up. 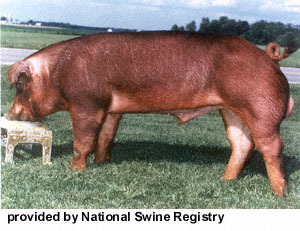 I read that pigs have about the strongest jaws around, but our sow, Red Rose, was gentle as could be. She loved it when I scratched the big thick skin behind her ears; she looked up at me and grunted a soft, sow, thank you. The sound of a her soft low grunts mixed in with the smell of straw, made me feel all happy and safe inside, like nothing could go wrong. Once I peaked down from the hayloft at Red Rose and I saw a newborn piglet just laying there beside her. You can bet I hightailed it right out of the loft to get a better look. Dad made me go to the house, ’cause I wasn’t allowed to see certain stuff: calves and piglets being born or operations to make the bulls into steers. When Dr. Freeze came to the back door asking for a teacup of warm water to melt his teeny frozen vials, I had to stay in the house; I figured out Dr. Freeze’s visits meant pretty soon Belle or Lightfoot would be expecting a calf. Rose looked a lot like this Jersey Red, but she was bigger and a girl. Our dog Nickki would eat just about anything, without stopping long enough to taste it. She just gulped meat, gravy, cooked vegetables, cereal, any table scraps. As long as the food was in her dish, she would eat it, otherwise, she stayed away. That was on account of her good training; she was as polite as any real kid ever was. Sometimes she slipped up, like when she bit the neighbor’s rat terrier when he sneaked over into our yard. That was a bad thing to do, but you know the neighbor’s rat terrier learned to fake a limp and would limp on over to our yard and look right at Nikki, just daring her to try to bite her again. Lots of times Mom told me to take the trash out and burn it in a big 55 gallon drum out back. Grandpa was a fireman before he started building and inventing stuff, so Mom taught me how carefully light the match, folding the safety flap over on top of the unused matches. Sometimes I ignored her; lighting fires was interesting. I lit all the matches at once then lit up a Kleenex; the whole kit-and-ka-boodle lit up super fast like imagined a fuse and a bomb would be, except no bang, just a fast fssstt of the matches followed by a soft whooomffs of the Kleenex with the smell of sulfur filling up my nose ’til I almost needed a Kleenex myself. Once Mom caught Bonita and me lighting a bunch of Kleenex on fire. “Just put your hands in your pockets and start whistling,” I told Bonnie. “Like Mickey Mouse does when he trying to look innocent. Bonita always had a jump-rope looped through her belt, just in case she needed to lasso a stray calf or a mountain lion. Mom got a hold of that rope, and whipped Bonita something fierce. Bonita howled so loud she scared me half to death. This time Mom’s threat of beating us to a pulp was for real. Then it was my turn. Mom grabbed my left hand and raised that rope up in the air. I was so scared I started galloping around Mom, jumping as high in the air as I could. Mom held on tight, the rope whistling in the air. A strange noise came out of Mom sounding a little bit like a cough and a little bit like a growl, which scared me into jumping higher and faster, just to get away from that mad-hatter beating. Next thing I knew, Mom was doubled over, holding her sides, shaking like Jello and laughing her guts out. “I never saw anyone jump so high,” she squeezed out, while she was gasping for breath. It turned out Bonita was just faking it, she wasn’t hurt even one iota. She said she never understood why I didn’t learn that trick. Even after all these years, I think it’s a lot better to make someone laugh that to pretend to be hurt and scare the begeezer out of people.